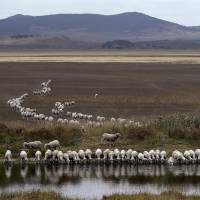 SYDNEY - California has turned to the world’s driest inhabited continent for solutions to its longest and sharpest drought on record. Australia, the land poet Dorothea Mackellar dubbed “a sunburnt country,” suffered a torturous drought from the late 1990s through 2012. Now Californians are facing their own “Big Dry,” and looking Down Under to see how they coped. Australia also faced tough water restrictions — along with dying cattle, barren fields and monstrous wildfires that killed 173 people. But when the rains finally returned, Australians had fundamentally changed how they handle this precious resource. They treat water as a commodity to be conserved and traded, and carefully measure what’s available and how it’s being used. Efficiency programs cut their average daily use to 55 gallons, compared with 105 gallons per day for each Californian. California water officials now routinely cite Australia’s experience. Felicia Marcus, who runs California’s Water Resources Control Board, can describe the stormwater-capture system watering soccer fields in Perth in minute detail. But Californians may find Australia’s medicine tough to swallow. From an Australian perspective, California’s drought response has been “absolutely pathetic,” says Daniel Connell, an environmental policy expert at The Australian National University. Australia: Overuse and drought had depleted Australia’s main river system, which winds across four states that produce a third of the nation’s food, and ran so low by 2002 that the Murray River had to be dredged to reach the sea. The government capped entitlements, canceled inactive licenses, bought back hundreds of billions of gallons from irrigators and strictly metered usage to make sure license holders use only their allocation. Availability now affects price as shares are traded on an open market worth $1.2 billion a year in U.S. dollars. The water that farms, industries and towns get depends on what is in the river; in drought, it can dwindle to virtually nothing. But entitlements can be bought and sold, keeping agriculture afloat. A farmer of a thirsty crop like cotton might not profit when both the share of water and the price of cotton are low. But if an orchard grower in desperate need buys that water, the cotton farmer can live off the sale while the orchard owner reaps a profitable harvest. California: The legislature last year required monitoring to be phased in gradually, eventually showing for the first time how much groundwater is being pumped. But roughly a quarter-million California households and businesses still lack water meters, and are not required to until 2025. The state relies on an honor system: Rights holders self-report their use of river and stream water every three years. Gov. Brown’s budget proposed last week would require monitors and annual usage reports. California: After voluntary cutbacks fell short, Brown’s administration mandated a statewide 25 percent cut in water use by cities and towns, and ordered more farmers to stop pumping from rivers and streams. Marcus said the one piece of advice that seemed universal in both Australia and California “was conserve, conserve, conserve, as early as you can, because it’s the cheapest, most economical way to buy time” while tougher water-saving measures are phased in. 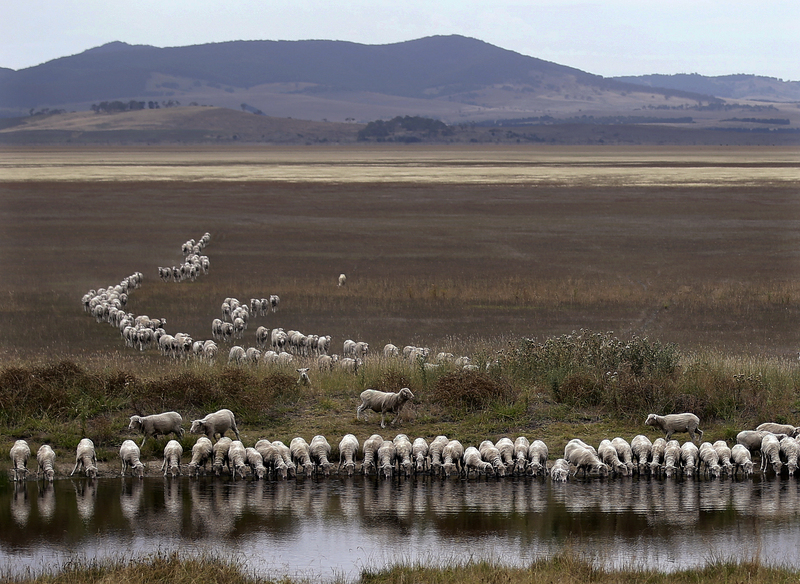 Australia: Australians began conserving long before their drought. In 1995, Sydney’s water authority was ordered to slash per-capita demand by 35 percent by 2011, and it met that target by reducing pressure and leaks in pipes, boosting businesses’ water efficiency, and offering low-cost, water-saving technologies in homes, such as dual-flush toilets, low-flow shower heads and rainwater tanks for gardens, toilets and laundry. With government rebates, these devices became common across Australia. Australia: Billions were spent on desalination plants in major cities, and many are not operating because cheaper water is now available in Australia, prompting critics to dismiss them as expensive and power-hungry flops that will create greenhouse gases and worsen the continent’s climate-change woes. Supporters say the plants will protect the country from the next inevitable drought. 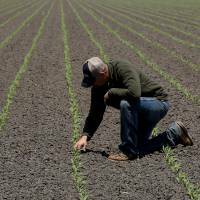 California: Brown has called for conservation while focusing on an ambitious, $17 billion plan, opposed by environmental groups, to build 39 miles of tunnel to take Northern California water to Southern California’s bigger farmers. Desalination plants also are envisioned: San Diego’s would be the biggest in the Western Hemisphere.